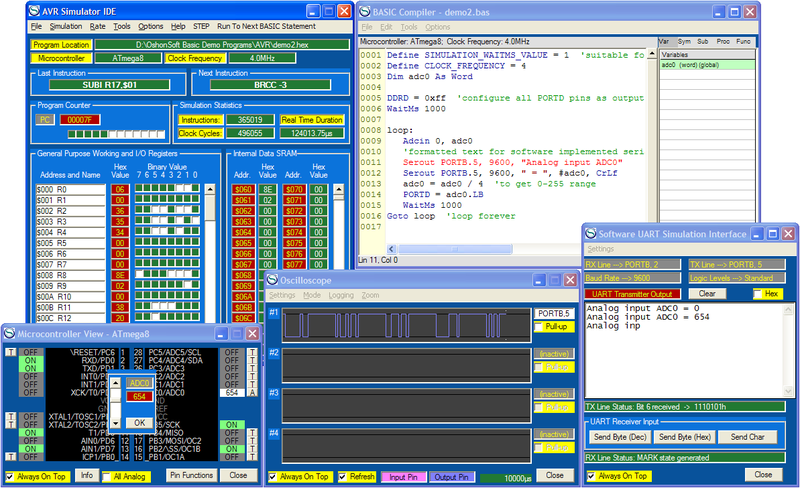 AVR Simulator IDE is powerful application that supplies Atmel microcontroller users with user-friendly graphical development environment for Windows with integrated simulator (emulator), avr basic compiler, assembler, disassembler and debugger. 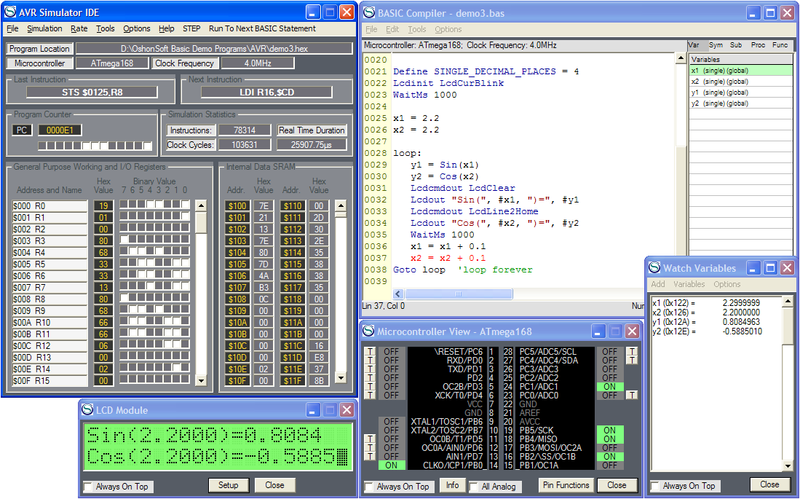 AVR Simulator IDE supports the extensive number of microcontrollers (MCUs) from the Atmel 8-bit megaAVR and tinyAVR architecture product lines and mature 90S family (selected ATmega, ATtiny, AT90S models). You are welcome to download the fully functional evaluation copy of the software on the downloads page. 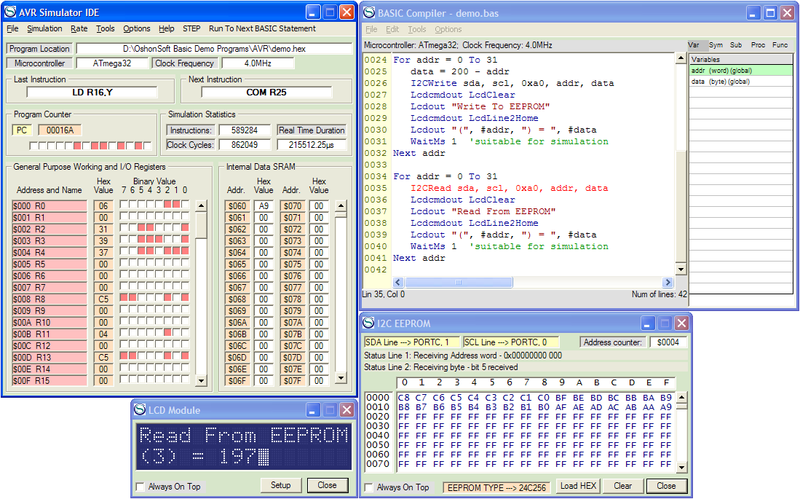 AVR Simulator IDE requires a license to operate after the evaluation period. For more information please visit the licenses page. Some of the microcontroller models currently come with the limited support. Additional Atmel microcontrollers sharing the same architecture will be supported in the new releases. !!! Important note for the Arduino boards users !!! : Please click here. AT90S2313, AT90S2323, AT90S2343, AT90S4433, AT90S8515, AT90S8535, ATmega8, ATmega8A, ATmega8U2, ATmega16, ATmega16A, ATmega16M1, ATmega16U2, ATmega16U4, ATmega32, ATmega32A, ATmega32M1, ATmega32U2, ATmega32U4, ATmega48, ATmega48A, ATmega48P, ATmega48PA, ATmega64, ATmega64A, ATmega64M1, ATmega88, ATmega88A, ATmega88P, ATmega88PA, ATmega128, ATmega128A, ATmega162, ATmega164A, ATmega164P, ATmega164PA, ATmega165, ATmega165A, ATmega165P, ATmega165PA, ATmega168, ATmega168A, ATmega168P, ATmega168PA, ATmega169, ATmega169A, ATmega169P, ATmega169PA, ATmega324A, ATmega324P, ATmega324PA, ATmega325, ATmega325A, ATmega325P, ATmega325PA, ATmega328, ATmega328P, ATmega329, ATmega329A, ATmega329PA, ATmega640, ATmega644, ATmega644A, ATmega644P, ATmega644PA, ATmega645, ATmega645A, ATmega645P, ATmega649, ATmega649A, ATmega649P, ATmega1280, ATmega1281, ATmega1284, ATmega1284P, ATmega2560, ATmega2561, ATmega3290, ATmega3290A, ATmega3290PA, ATmega6490, ATmega6490A, ATmega6490P, ATmega8515, ATmega8535, ATtiny13, ATtiny13A, ATtiny24, ATtiny24A, ATtiny25, ATtiny26, ATtiny44, ATtiny44A, ATtiny45, ATtiny84, ATtiny84A, ATtiny85, ATtiny261, ATtiny261A, ATtiny441, ATtiny461, ATtiny461A, ATtiny841, ATtiny861, ATtiny861A, ATtiny1634, ATtiny2313, ATtiny2313A, ATtiny4313.